I’ve been doing agility for 15 years now. My life revolves around agility to a great extent. I love it – it allows me to have an even greater bond with my dogs, I’ve met some of my best friends through agility, and I travel the world thanks to agility. At the same time, it’s sometimes easy to get lost in all the competitiveness, mean gossip, judgement, striving to succeed no matter what. With all my love for the sport, I see some things around me that I don’t like and because of that I try to have some things to keep me grounded. I call them my anchors. My first anchor is the fact that I’ve been dreaming about having a dog my whole childhood. My mother says it was one of the first sentences I said and it is a bit peculiar, considering that no one in my family had dogs. Yet I felt I needed one, I wanted one and decided I would have one as soon as possible – which happened to be when I started living on my own some twenty years later. I tell my mom that because I never got a dog as a child, now I’m overcompensating and that’s why I currently live with seven of them. 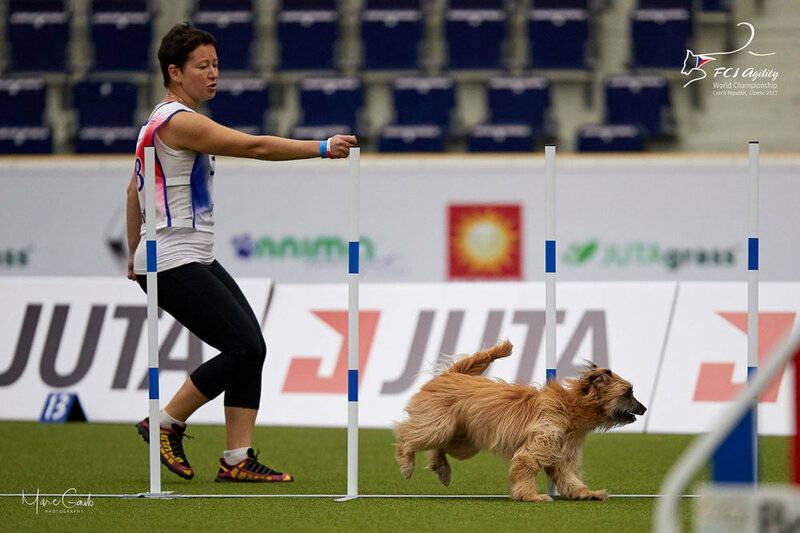 One day, long before I finally got a dog, during a dog show I saw an agility competition and I thought immediately: “This is something I want to do with my dog”. And now, four dogs later, I try to remember that sentence: “This is something I want to do with my dog”. NOT: “This is something I want a dog for”. I spend pretty much all of my time with my dogs, since I’m lucky to work mostly from home. We go for walks, we train, we cuddle on the sofa, they sleep in the bed with us – and we also do agility. It’s one of the many things that I enjoy doing with my dogs. So in a nutshell, the first anchor is: Love the dog first, and the sport second. My second anchor is Rolling Stone’s lyrics: “You can't always get what you want /But if you try, sometimes you find / You get what you need”. I happened to forget my first anchor once, when I got my second dog. I actually thought I wanted “a dog for agility”. What I got instead was the most intelligent dog I’ve ever met, that was also highly reactive and hyperactive and in the end the best teacher I could get, for he showed me all my shortcomings as a trainer and even as a human being. I made all the possible mistakes with him. I dreamt of training him to become an agility champion – instead I learnt a load of important lessons on how important good foundations are, how incredibly deep the relationship with a dog can be and that a dog is capable of doing basically everything for you if you build that relationship, how important it is to let the dog dictate the pace of the training. All my next dogs are hugely in debt to Vigo, because it is only thanks to him that they got a decent trainer and handler for an owner. It’s a pity they don’t realize that, because he’s grumpy, old and an ultimate fun-police nowadays. My third anchor is that… agility is not important. It’s not the cure for cancer. It’s not the solution to world hunger or pollution. Polona Bonac once told us in a seminar that we’re all basically a bunch of weirdos. When you go to an agility competition in the morning, you’ll see a group of people, in rain or shine, who are barely awake, wandering around some obstacles muttering“cik cik, tunnel tunnel, go on, go on, cak cak cak” etc. to themselves and then you’ll understand that it’s true. I remember driving to Agility World Championship 2008 in Helsinki. It took me two days behind the wheel of an ancient Mazda to get there, and at some point I realised I would basically spend four days driving for four runs in the ring, each of them lasting less than a minute. Was it worth it? Sure was, but that doesn’t change the fact that you have to be crazy to even consider doing so. The fact that agility is not important and that you’re crazy for doing it means it’s totally not worth getting nervous, annoyed or disappointed about it, but it’s totally worth celebrating all the small successes you have and having fun. I mean the only good reason to do something that ultimately doesn’t matter at all, is that you enjoy it. Now, I’m only human and of course now and then I forget about all of the above. Fortunately, my most important anchors are my dogs and they never cease to set me straight. During the 15 years that I’ve been doing agility, I’ve owned five dogs and competed with nine different dogs altogether. Each of these dogs is different and each of them taught me something new. My first dog, Sunday, let me experience for the first time that amazing sense of understanding and unity that you sometimes get during a fabulous agility run and showed me this is what you should be chasing after in this sport. My second dog, Vigo, taught me everything. My third dog, Brava, showed me that the only way to get a perfect dog, is to believe from the first moment that the dog already is perfect. My fourth dog, Brego, reminded me all over again that agility is about having fun with your dog and making the most of your team’s potential, not about winning stupid plastic cups and bags of dog food. He did so by growing up to be 44 cm at the withers. People kept telling me I made a mistake keeping a male from Brava’s litter and that a small large Pyrenean Shepherd would never be competitive in large class. Other people were complimenting me on taking the disappointment well. I thought how lucky I was to get him - a dog with endless enthusiasm, a naturally great jumping style and enough will to please to suffice ten dogs. My youngest dog, Mojo, is actually called “ALL I NEED” and she keeps telling me that although you have medals from EO and AWC, you know nothing, Jon Snow. But she is bound to teach me. I can’t wait! One of the reasons AgiNotes exists is that it helps you concentrate on your dog’s individual needs. Every puppy has his/her challenges and you need to grow together, build a strong bond and learn how to celebrate small wins. This way you will take steps towards the best version of you two as a team. Newer PostNew release out now!